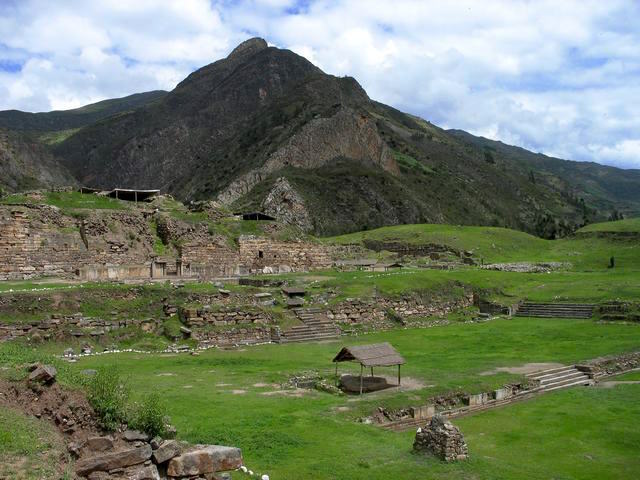 Chavín de Huántar is an archaeological and cultural site in the Andean highlands of Peru. Once thought to be the birthplace of an ancient “mother culture,” the modern understanding is more nuanced. The cultural expressions found at Chavín most likely did not originate in that place, but can be seen as coming into their full force there. The visual legacy of Chavín would persist long after the site’s decline in approximately 200 B.C.E., with motifs and stylistic elements traveling to the southern highlands and to the coast. The location of Chavín seems to have helped make it a special place—the temple built there became an important pilgrimage site that drew people and their offerings from far and wide. 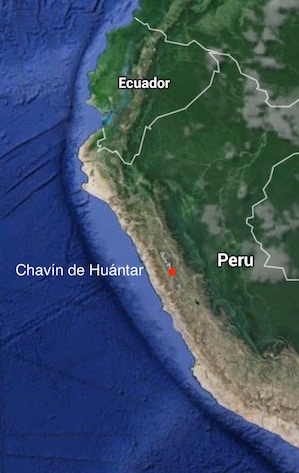 At 10,330 feet (3150 meters) in elevation, it sits between the eastern (Cordillera Negra—snowless) and western (Cordillera Blanca—snowy) ranges of the Andes, near two of the few mountain passes that allow passage between the desert coast to the west and the Amazon jungle to the east. It is also located near the confluence of the Huachesca and Mosna Rivers, a natural phenomenon of two joining into one that may have been seen as a spiritually powerful phenomenon. The temple complex that stands today is comprised of two building phases: the U-shaped Old Temple, built around 900 B.C.E., and the New Temple (built approximately 500 B.C.E. 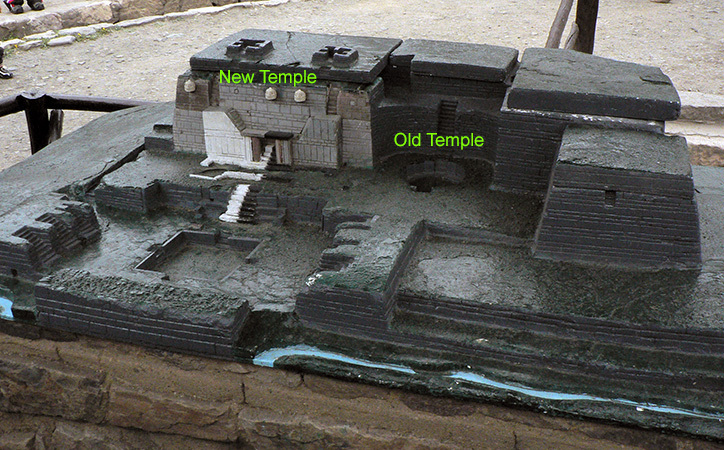 ), which expanded the Old Temple and added a rectangular sunken court. The majority of the structures used roughly-shaped stones in many sizes to compose walls and floors. Finer smoothed stone was used for carved elements. From its first construction, the interior of the temple was riddled with a multitude of tunnels, called galleries. While some of the maze-like galleries are connected with each other, some are separate. The galleries all existed in darkness—there are no windows in them, although there are many smaller tunnels that allow for air to pass throughout the structure. Archaeologists are still studying the meaning and use of these galleries and vents, but exciting new explorations are examining the acoustics of these structures, and how they may have projected sounds from inside the temple to pilgrims in the plazas outside. It is possible that the whole building spoke with the voice of its god. 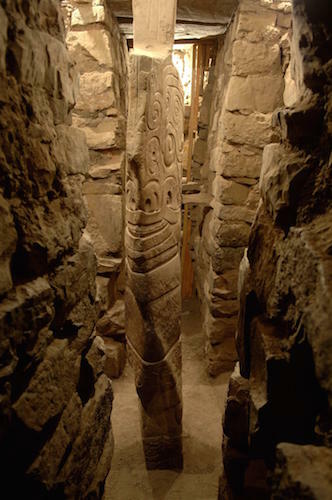 The god for whom the temple was constructed was represented in the Lanzón (left), a notched wedge-shaped stone over 15 feet tall, carved with the image of a supernatural being, and located deep within the Old Temple, intersecting several galleries. Lanzón means “great spear” in Spanish, in reference to the stone’s shape, but a better comparison would be the shape of the digging stick used in traditional highland agriculture. That shape would seem to indicate that the deity’s power was ensuring successful planting and harvest. 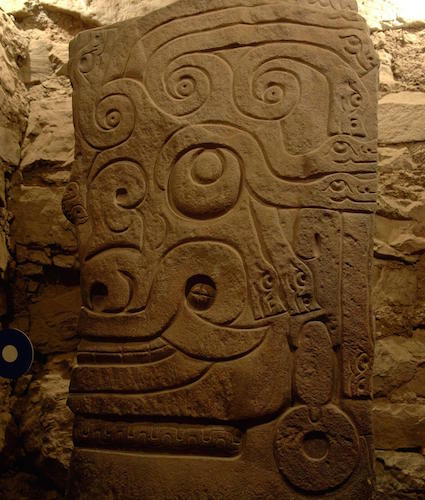 The Lanzón depicts a standing figure with large round eyes looking upward. Its mouth is also large, with bared teeth and protruding fangs. The figure’s left hand rests pointing down, while the right is raised upward, encompassing the heavens and the earth. Both hands have long, talon-like fingernails. A carved channel runs from the top of the Lanzón to the figure’s forehead, perhaps to receive liquid offerings poured from one of the intersecting galleries. Two key elements characterize the Lanzón deity: it is a mixture of human and animal features, and the representation favors a complex and visually confusing style. The fangs and talons most likely indicate associations with the jaguar and the caiman—apex predators from the jungle lowlands that are seen elsewhere in Chavín art and in Andean iconography. The eyebrows and hair of the figure have been rendered as snakes, making them read as both bodily features and animals. The serpent motif seen in the Lanzón is also visible in a nose ornament in the collection of the Cleveland Museum of Art (above). This kind of nose ornament, which pinches or passes through the septum, is a common form in the Andes. The two serpent heads flank right and left, with the same upward-looking eyes as the Lanzón. The swirling forms beneath them also evoke the sculpture’s eye shape. An ornament like this would have been worn by an elite person to show not only their wealth and power but their allegiance to the Chavín religion. Metallurgy in the Americas first developed in South America before traveling north, and objects such as this that combine wealth and religion are among the earliest known examples. This particular piece was formed by hammering and cutting the gold, but Andean artists would develop other forming techniques over time. Richard L. Burger, Chavín and the Origins of Andean Civilization, London: Thames and Hudson, 1992. R. L. Burger, “The Sacred Center of Chavín de Huántar” in The Ancient Americas: Art from Sacred Landscapes, ed. by R.F. Townsend (The Art Institute of Chicago, 1992), pp. 265-77. Cite this page as: Dr. Sarahh Scher, "Chavín de Huántar," in Smarthistory, August 9, 2015, accessed April 24, 2019, https://smarthistory.org/chavin-de-huantar/.